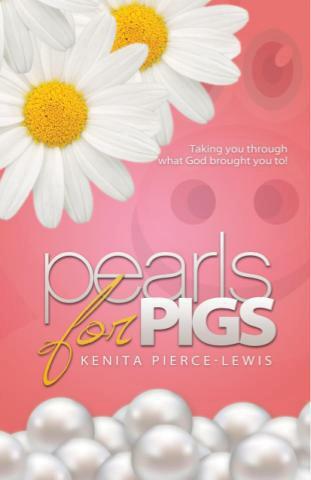 Pearls for Pigs is a one-minute devotional that gives you pearls of encouragement when you can’t seem to encourage yourself. No matter what storm you find yourself in, Pearls for Pigs can help you change your focus and cause light to shine through the cloudiest of days. Believe that God has better for you! Just a minute a day keeps depression away! Minister Kenita Pierce-Lewis was born and raised in Champaign, Illinois. Her love for the Lord started at the young age of 6 in which she was baptized. She strayed away from the church during her teenage years, but found her strong foundation calling her back to the Lord in her early twenties. At the age of 25 she had a unique encounter with God and has been walking with Him ever since. She soon learned that gifts of the Holy Spirit were strong within her. She began to operate in the leadership of Crossroads "The Cornerstone of Abundant Life" Community Church at the age of 28 and accepted the Lord's call on her life at the age of 31 becoming a licensed Minister of God. Her ministry has touched many hearts of all genders, nationality, ethnicity, and ages. She is the mother of three children and the wife of Deacon Deon Lewis.